All of our readers are likely quite familiar with the cult of the Kim family: Kim Il Sung, Kim Jong Il, and Kim Jong Un, as well as the cult surrounding Kim Il Sung’s first wife Kim Jong Suk. But they are possibly less aware of other members of the Kim family who also once enjoyed their own small personality cults: namely Kim Song Ae (김성애), another of Kim Il Sung’s wives, and Kim Jong Un’s mother Ko Yong Hui (고용희). Information about Kim Song Ae’s early years is scarce. The most important source is a book written by Ryo Chong – a pseudonym for a high-ranking North Korean officer, who was purged in 1959 and, after a decade in a labor camp, successfully fled to China in 1969. Kim Song Ae was the daughter of a counselor in the Secretariat of the DPRK’s Cabinet of ministers. In late 1950, when Pyongyang was taken by UN forces and Kanggye became the provisional capital of DPRK, she was assigned to Kim Il Sung to work as his “attendant secretary”(시종비서), becoming something resembling a housekeeper. The Premier and his secretary became intimate and, in 1951, Kim Song Ae told Chairwoman of the Union of Democratic Women Pak Chong Ae that she was pregnant. 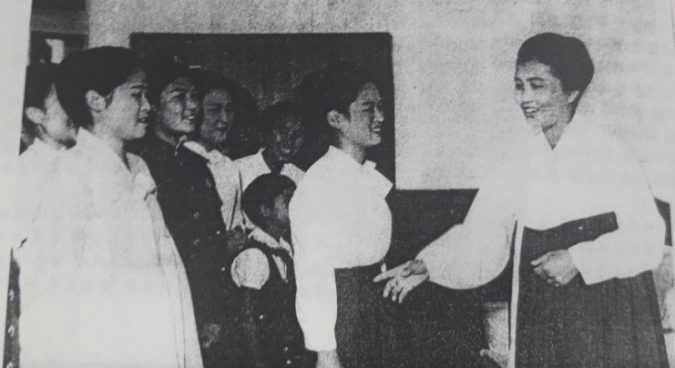 According to multiple independent testimonies, Pak was something of an unofficial manager for Kim Il Sung’s harem, so she was a logical person to inform. The Premier and his secretary then had something of a shotgun wedding. For several years, Kim Song Ae’s existence remained a secret, until in 1958, when she was acknowledged as Kim’s wife to the party elite – though the Rodong Sinmun remained silent on the news. There are credible rumors that Kim’s brother was DPRK second Minister of National Defence Kim Kwang Hyop. 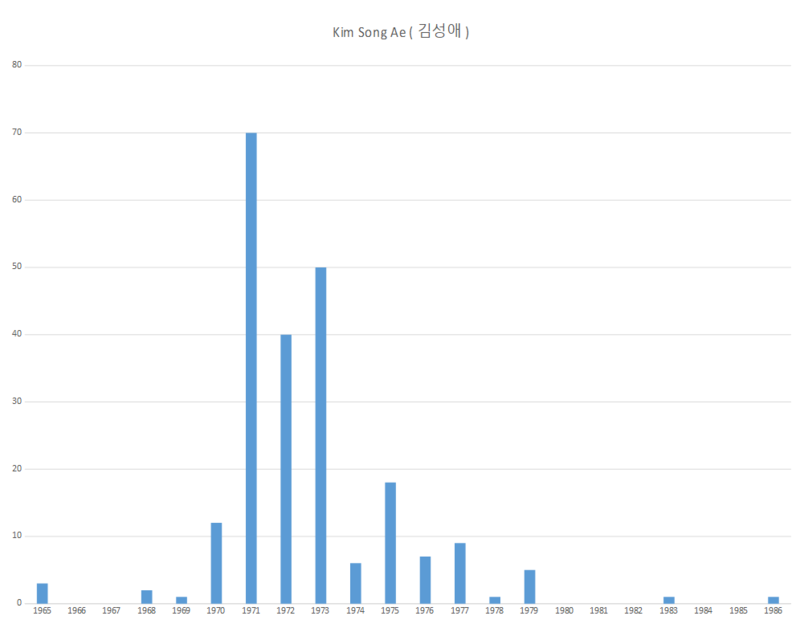 Kim served at the position from 1957 to 1962, but it was only after his demise that Kim Song Ae’s rise began. On September 14, 1965 she was finally mentioned in the Rodong Sinmun: in an article reporting her meeting with Andrée Touré, the first lady of Guinea, she was referred to as “the wife of the DPRK’s Premier”(내각수상부인 김성애 녀사). The problem this First Lady faced was that the Great Leader already had a son – Kim Jong Il, from his marriage with his previous wife Kim Jong Suk. A lot of rumors suggest that Kim Song Ae was actually pushing for her son, Kim Phyong Il, to become the successor, and that the elite was split as to who it should be. Allegedly, Nam Il and Choe Yong Gon supported Phyong Il, while O Jin U backed Jong Il. Kim Jong Il was not a great fan of his stepmother. The Soviet embassy at the time reported a rumor of an incident which allegedly took place during Kim Il Sung’s visit to the USSR in the late 1950s. He took his wife and son with him, and when Kim Song Ae reprimanded Kim Jong Il, the boy tried to push her out of the car. In 1966-67 Kim Song Ae disappeared from the state media and one would have hardly expected her to reemerge. Yet she did eventually – and quite spectacularly. She was mentioned again in the Rodong Sinmun in 1968, and there were reports about the state establishing “Rooms of Study” for her ideas next to those dedicated to Kim Il Sung. In 1970 she became a member of the Central Committee. By 1971 a small personality cult became public when she was appointed the Chairwoman of the Union of Democratic Women. 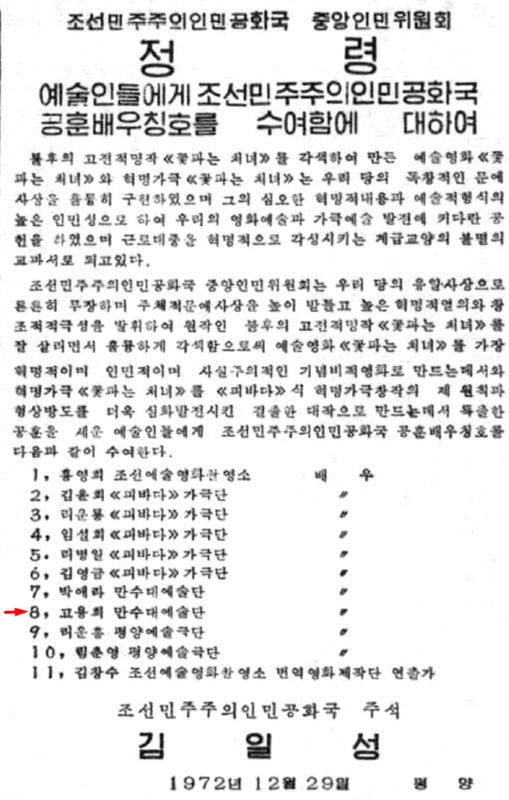 From 1970 to 1973 North Korean media used grammatical forms of respect (-께서 and -시-) when referring to her. This forms were usually reserved for Kim Il Sung, and showed the very special place this woman had begun to occupy in the country. After she became a Chairwoman of the Korean Union of Democratic Women, she received a title, too: Respected Chairwoman (존경하는 위원장), and the Union’s journal, the Choson Nyosong, published a few articles dedicated to the Respected Chairwoman’s guidance. It should be noted that her cult was tiny in comparison with that of Kim Il Sung. In available photos one could see only Kim Il Sung’s portraits being displayed, only his name was written in bold and it was he, not Kim Song Ae, who was described as “The Great Leader of the Korean Women’s Movement” (조선 녀성운동의 위대한 령도자). As Kim Jong Il’s rise began, however, his stepmother’s star began to fade. 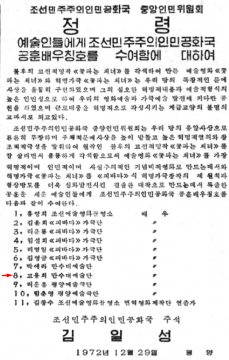 On March 7, 1974, the Rodong Sinmun mentioned the “Party Center” (당중앙) for the first time – a codename for Kim Jong Il. 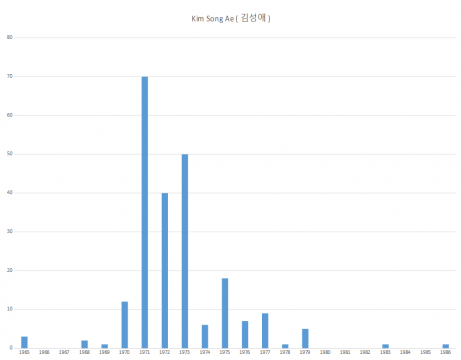 The same year, the frequency of mentions of Kim Song Ae fell and she was no longer referred to with respectful affixes. Interestingly, the fall of Kim Song Ae corresponded with, as Andrei Lankov pointed out to this author, the release of the film “Our Family’s Problem” (우리 집 문제, produced in 1973), which, rather uncharacteristically for DPRK cinema, presented a negative North Korean character: the evil wife of a good cadre. 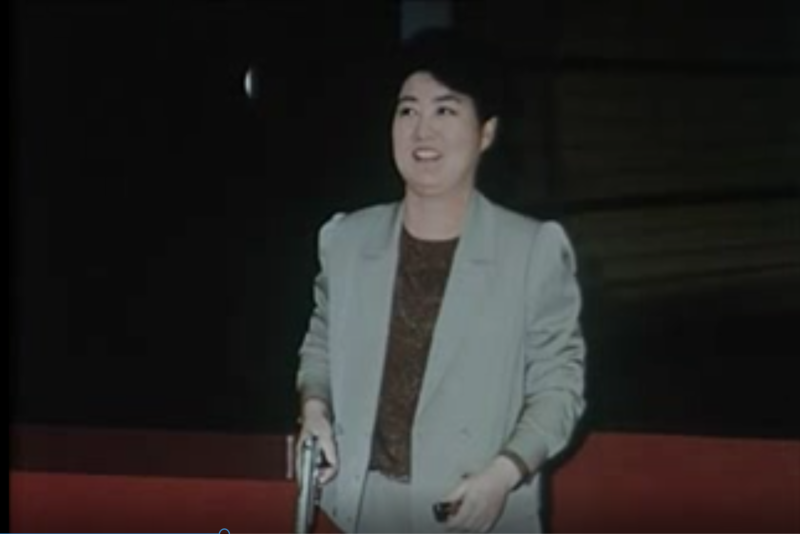 When you see that the actress playing the malevolent villainous woman bears a resemblance to Kim Song Ae, and remember that Kim Jong Il was responsible for cinema at the time, the film’s message is rather suspicious. In 1974, Kim Song Ae’s brothers, Kim Song Gap (political commissar of the Navy) and Kim Song Ho (Secretary of North Hwanghae Province) were seemingly purged as well, as were other people promoted by her. For this ambitious woman, it was a defeat, but not the end. In 1980, she was reappointed to the Central Committee, and in 1982, was awarded the Order of Kim Il Sung. This award corresponded with the production of a sequel to “Our Family’s Problem” – “Our Neighbors’ Problem” (우리 옆집 문제), which showed the villainous woman from the previous film as a reformed and noble person. In the 1980s, Kim Song Ae disappeared almost completely from the state press, and since 1986, she has not been mentioned at all. 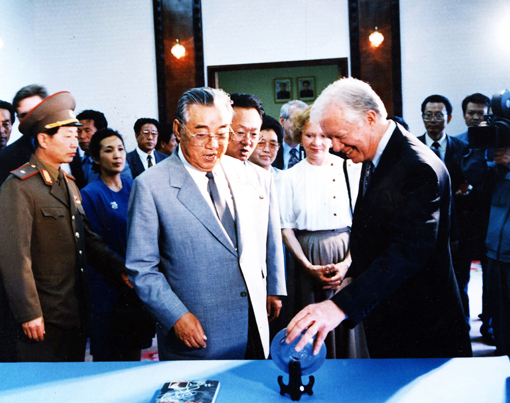 What was potentially Kim Song Ae’s final public appearance came during ex-President Jimmy Carter’s visit to North Korea in 1994. She was photographed accompanying Kim Il Sung, showing that despite her loss of political power she was still loved by her husband. 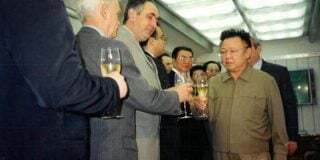 Nothing is known for sure about her later fate, but in 1998 she was not reappointed to the Supreme People’s Assembly, ending the long and ultimately unsuccessful political career of one of the most notable women in North Korean political history. Rumors suggest that she ended up living in a villa far away from Pyongyang. Eventually, they say, she passed away several years ago, somewhere in the early-to-middle 2010s. Ko Yong Hui, Kim Jong Un’s mother, was born in the enemy land of Japan and was one of many Japanese-Koreans who chose to return to the homeland and go to the DPRK. She eventually became an actress in the famous Mansudae troupe: while it is not known when she began dating Kim Jong Il, most point to sometime in the 1970s. The first thing which needs to be said about Ko is that her name is often misspelled. 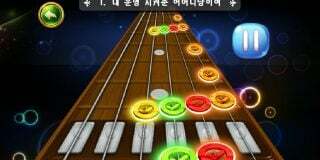 The correct spelling is 고용희(Ko Yong-hŭi in McCune-Reischauer) and not 고영희 (Ko Yŏng-hŭi). As one can see below, the correct spelling was used in an order from Kim Il Sung, bestowing upon her the title of Merited Actress. The campaign promoting Ko began years later, in 2002, when she was given the title of “Respected Mother” (존경하는 어머님). Interestingly, the Respected Mother was not named “Ko Yong Hui” in official publications. She had been too well-known before becoming the first lady, and her background as a Japanese-born actress was far from the revolutionary ideals espoused by the state. 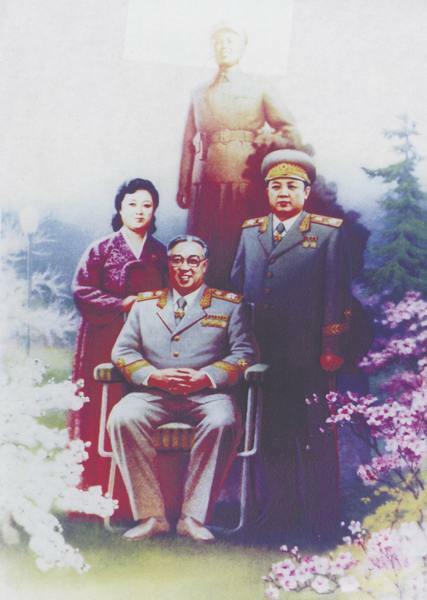 One example of her minor cult is a secret document published in 2002, called “The Respected Mother is the most faithful of the faithful, endlessly loyal to the Beloved and Respected comrade Supreme Commander” (존경하는 어머님은 경애하는 최고사령관 동지께 끝없이 충직한 충신중의 충신이시다). Apart from that, the document also portrayed her as being kind to the soldiers and ready to defend Kim Jong Il with her life – as all North Koreans should be. The campaign did not last long, as Ko Yong Hui died in a car crash in Paris in 2004. Kim Jong Il got himself a new girlfriend: Kim Ok. 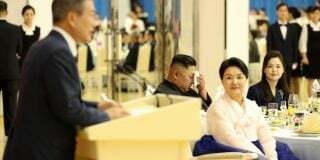 Nevertheless, it was Ko’s son who inherited the throne – and when the succession of Kim Jong Un was confirmed, the DPRK composed a film dedicated to her, called “the Mother of the Great Songun Korea” (위대한 선군 조선의 어머님). The film was not shown on state TV, but was distributed to top officials, with the content rather similar to the propaganda campaign from the early 2000s. 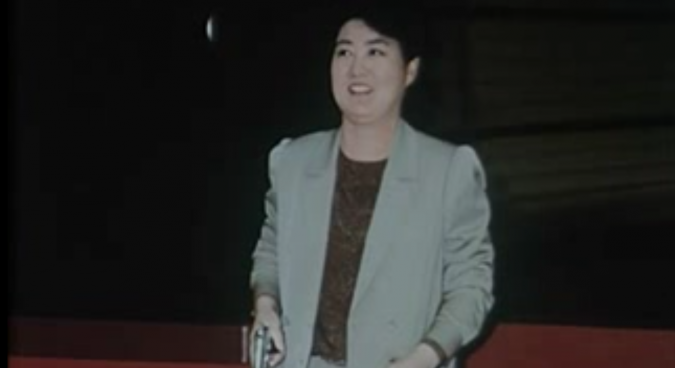 She was directly compared with Kim Jong Suk, and the film showed her doing an impression of the “Heroine of the Anti-Japanese Struggle” – holding a pistol in her hand. As a picture below shows, this probably was not the merited actress’s finest role. Continuing the idea of the “Respected Mother” being the second coming of Kim Jong Suk, the film asserted that Ko had gifted Kim Jong Il the coat he would later use during “on-the-spot guidance” and this is why the Fatherly Commander usually appeared wearing this civilian dress. “She,” claimed the film, “did not want a title or a position for herself,” solidifying the tradition of the North Korean first lady not taking a formal rank in the state hierarchy. Furthermore, the film hinted that Ko Yong Hui was the one who pushed the creation of the “Song of the Commander Kim Jong Il” (김정일 장군의 노래), saying that the song should be created by the army. Perhaps this is the reason why the “Song of the Commander Kim Jong Il” is a slightly modified version of the song “We Will Eternally Venerate You, Our Commander” (영원토록 받들리 우리 장군님), which appeared in 1996: the Respected Mother’s command had to be followed, and followed immediately. 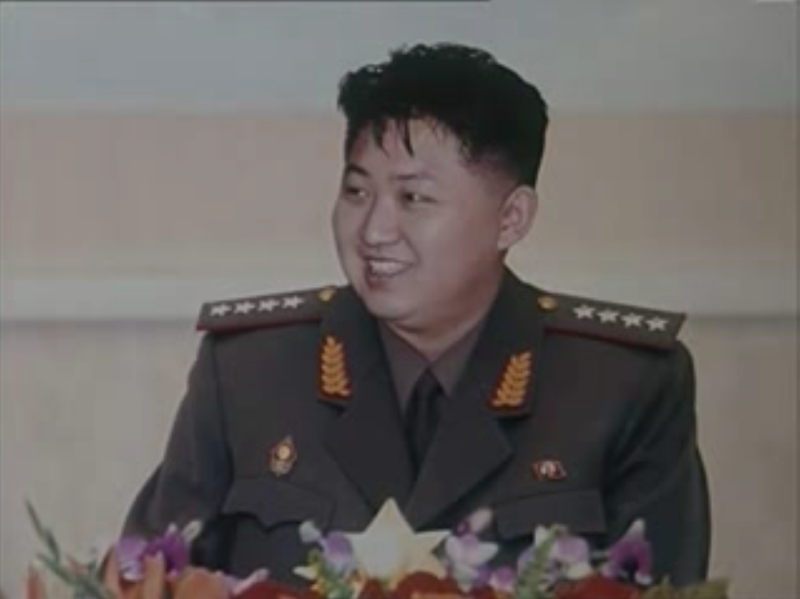 Finally, the film featured the only widely-available image of Kim Jong Un wearing a military uniform. This was before his promotion to Marshal, when he was called the “Young General” (청년 대장). The Respected Mother was given credit for his good upbringing. Kim Song Ae and Ko Yong Hui’s stories were very different. Kim was an ambitious woman, who was outsmarted by her stepson, removed from power, and died in relative obscurity. Ko was an actress with few ambitions, who became known before she met her husband and whose life story was very different to the image of an ideal North Korean wife. Yet there were some similarities between the two. Both were given a propaganda campaign, with “Respected” being the main title. Both were praised for their loyalty to their husbands – both were removed from the state media when they became inconvenient. Kim Jong Un’s wife Ri Sol Ju is, for now, not typically praised by state media. But if you see her begin to be called “Respected,” this may be a sign that her power is growing. 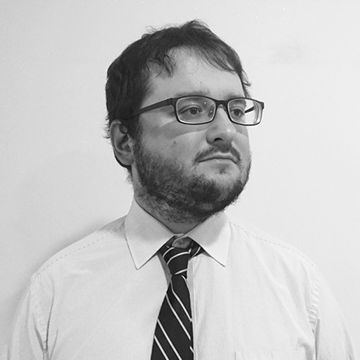 Subscribe to read the remaining 2065 words of this article.